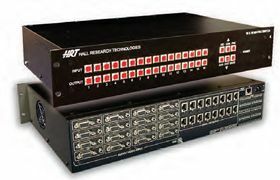 Hall Research’s Genesis Series of HD and PC matrix switches now boasts the addition of video over twisted pair extension on all outputs. The 8x8 and 16x16 compact video matrix switches can now be ordered with RJ45 outputs that send highresolution video and power to compatible remote receivers over a single Cat-5e/6 twisted-pair cable. A variety of receiver options are available from cost effective Component Video active Balun to VGA/YPbPr wallplate receivers. The AV matrices are available with or without audio, and feature RS-232 and IP controls and support PC video resolutions to 1920x1600 and analog Component Video from 480i to 1080p. Tannoy’s QFlex defines a new set of performance benchmarks including class-leading steering capability and control over the widest possible bandwidth, delivering unheralded intelligibility and musical fidelity in even the most acoustically imposing spaces. QFlex uses multiple channels of advanced amplification and DSP to produce beams of acoustic energy, which are directed on user defined target areas. With this ability comes better speech intelligibility in highly reverberant spaces. Pantel is launching multiple new weatherproof digital signagespecific LCD monitors. The new 42- and 52-inch models have been designed specifically for use in commercial applications, whether indoors or outdoors in the elements. They are available with an optional internal computer package and also in either vertical or horizontal configurations. Outdoor commercial advertising used to be a very concerning and expensive project due to the threat of unpredictable weather. Beyond being weatherproof, because many commercial outlets utilize video advertisements in an ongoing loop specific to their business, such as a movie theater promoting its current lineup or a restaurant promoting its menu, Pantel offers with its digital signage monitors an optional internal CPU package to run such audio and video advertisements. Stage Research’s Video 101 Manager has been upgraded to let the producer/ stage technician route live video as an input. This new function of Video 101 Manager will let the end-user mix and blend live, and/or canned, motion over dance, musical performance, theater, or even corporate podium/panel presentations. Stage Research’s updated Video 101 Manager is rich in all the time-cutting features of the standard version. This means the end user can play most video formats, as well as route video to any video output on their computer. This SFX extension, free to all current SFX 6.x users, will also allow one to locate video manager on the same computer as SFX, or anywhere on the network, as well as fade videos in and out/cross fade between different videos. Seek, Stop and Play functions on this SFX-controllable product render it simple to use and understand. The Sony the SRX-T110 and SRX-T105 projectors are equipped with three Silicon X-tal Reflective Display devices and deliver a resolution of 4096 x 2160 pixels — more than four times the resolution of consumer HDTV. This highresolution capability allows 2K images to be displayed simultaneously in four quadrants or in a twin side-by-side display. The projectors also offer a contrast ratio of 2500:1. In addition, the SRXT110 provides a high brightness of 11,000 lumens, while the SRX-T105 offers a brightness of 5500 lumens. Draper’s new TorkStar Utility Line Set is designed to raise and lower a wide range of products commonly used on stages and in gymnasiums and churches and other public venues. TorkStar is an inherently safe, simple lifting system designed for intermittent usage, which can be used to raise and lower lighting, speakers, backdrops, scenery, banners, flags, projection screens, and more. TorkStar eliminates the need for stepladders, scaffolding, or lifts to service or change lamps, filters, or other ceiling suspended items. In the event of an electrical outage or motor failure, there is sufficient braking capacity to arrest the entire system. Aviom has released a major firmware upgrade for its Pro64 Series of digital snake and audio networking products. The software release, which is available for free download from Aviom’s website, www.aviom.com, includes support for m-control for Yamaha digital consoles. With m-control, a user has direct access to the preamp settings on Aviom’s 6416m mic input modules from the user interface of most Yamaha digital consoles outfitted with a 6416Y2 A-Net interface card. The m-control feature offers another control path for Aviom’s Pro64 Series mic pre. All settings on the 6416m can also be set from the device’s front panel. Elite Screens’ EZ-Cinema Floor Pull- Up Projection Screen. This lightweight, portable screen is easily carried and sets up quickly for any rental and staging or portable educational or business applications. The screen is easily pulled up out of its metal casing and put into place with adjustable dual boom telescoping supports for versatile height settings that can be used in variable space requirements. It then descends just as easily and is packed away in seconds. Elite’s EZCinema line of projection screens feature a flame-retardant matte white screen that is durable and easy to clean. Juice Goose’s XVRT Models use a line interactive design to regulate incoming power to ensure a stable 120 VAC output. This feature improves power quality for connected equipment and also reduces battery usage during minor utility power faults. In addition to voltage regulation, the XVRT Series provides line surge protection and up to 50 dB of line noise filtration. Battery run time ranges from two minutes to more that 30 minutes depending on the load. The VGA Wireless Video Presentation System, the AC1130A, from Black Box is an easy and economical way to make any VGA projector wireless. With this plug-and-play device, you can use a Windows laptop with a WiFi card to access a projector from up to 200 feet away. The system supports up to 254 users and is ideal for conference rooms, training facilities, classrooms, auditoriums, or anywhere else VGA projectors are used. The system’s receiver attaches directly to any SVGA or WXGA projector and communicates with any Windows PC with 802.11b/g capabilities. Users can share and stream MPEG formats directly from a laptop to the projector or other display device with a VGA port. No more swapping cables in and out at the projector when you want to switch presenters. AudioSource’s complete line of new 2-channel and subwoofer amplifiers are now shipping. The AMP102, AMP110, AMP210, and AMP310 2-channel amps and the AMPSUB210 subwoofer amp round out AudioSource’s complete line of versatile audio electronics. AMP310, AMP210, and AMP110 include Triple-Darlington power amplifier stages with complementary 15A bipolar output transistors and high-current, low-distortion drive for complex real-world loudspeaker loads. Their fully symmetrical power amplifier topology is a dual-differential error amplifier with circuit linearity that preserves signal integrity and selectable mains voltage with IEC mains inlet for use in worldwide markets. Vizio’s VL and VT Series enhances the performance of Full HD 1080p LCD HDTVs with 120Hz Smooth Motion II technology. The VL Series consists of four new models ranging from 32-inches to 47-inches. Each model in the VL and VT Series incorporates Vizio’s Smooth Motion II technology that refreshes motion picture images at twice the speed of standard 60Hz models, eliminating blur from fast-action movie sequences. Vizio’s Mega Dynamic Contrast Ratio increases overall contrast ratio and picture quality, especially in brightly lit rooms. The resulting contrast ratio rivals the performance of the best plasma displays. Vivitek’s HC7500A projector blasts in full 700-lumen brightness, with a precise imaging 35,000:1 contrast ratio. With full HD resolution and wide-screen capabilities, Vivitek’s new projector is a complete cinema experience. The unit is a new curved design with centered lens for easy installation and screen adjustments. With a footprint the size of a small laptop, the new projector is perfect for out-of-site mounting or cabinet storage. The projector also has a full slate of low-energy and low-power consumption features, which also translate into low cost of ownership starting with the lamp-free, LED light source estimated at more than 20,000 hours. Maxedia Broadcast, the latest generation of Martin Professional’s user-friendly Maxedia media composer and playback device, is optimized for high definition playback with ultra-fast quad core processors, 1080p playback support, and two dedicated engine outputs. Maxedia Broadcast contains the fastest hardware available for powerful and smooth playback of high definition content. Nearly a terrabyte of drive space in a RAID array is available to support even the largest shows. Two powerful graphics cards provide a dedicated user interface plus two engine outputs.